A farewell reception was held in Islamabad in honour of H.E. Dr. Nedim Makarevic, outgoing Ambassador of Bosnia and Herzegovina to Pakistan. The reception was organized by COMSATS (Commission on Science and Technology for Sustainable Development in the South) and Institute of Peace and Diplomatic Studies. 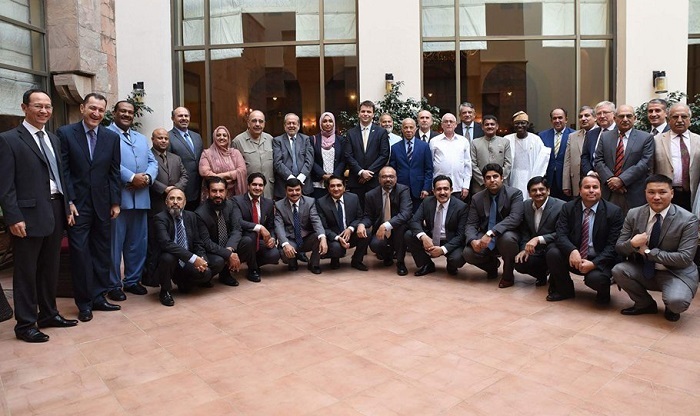 During the reception, large numbers of Ambassadors from the diplomat corps of Islamabad were present to grace the occasion to bid farewell to their colleague. Speaking on the occasion, H.E. Dr. Nedim Makarevic said that Pakistan is one of the wonderful countries of the world. “During my presence in the country, my aim was to promote and highlight the relationship to much higher level than before” he said. The Ambassador was of the view that Education is the key to solve all challenges that Pakistan is facing today. It is important to note that during H.E. Dr. Nedim arranged an agreement of cooperation between NUST for scholarship for students from Bosnia and established Pak-Bosina Education Foundation. Mrs. Farhat Asif, President, Institute of Peace and Diplomatic Studies, highlighted the role of the Ambassadors and Challenges they face during their hour of duty in the other country. During the ceremony, it was also announced by H.E. Mr. Walid Abu Ali, Ambassador of State of Palestine about the recent membership of Palestine in Interpol-an intergovernmental organization facilitating the international police cooperation.